Happy New Year! I must say I spent New Years Eve sitting in the recliner all bundled up, sniffing, coughing and going through an entire box of Kleenex. Today, I am feeling much better. A while ago, I was looking at tutorials on http://www.stamptv.com/ Gina covered a Kleenex box. This is one of those projects that you tuck away for a rainy day. Well, today it's raining and after yesterday, I have an empty Kleenex box....Gina's tutorial is super easy to follow. 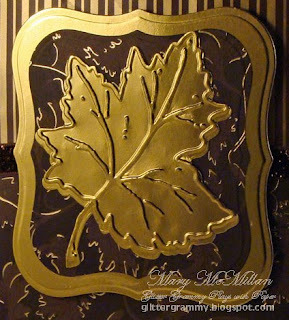 I used metallic paper, rather than card stock. The card stock would have made the project more sturdy, but the paper worked well too. The paper is from a PaperPizzaz Metallic Book. 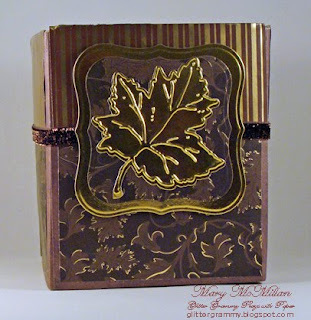 The Spellbinder I used is Labels 1 and the leaf is a Cuttlebug die and embossing folder. The ribbon I purchased at Paradise Scrapbook Boutique http://paradisescrapbookboutique.typepad.com/ along with the Labels 1 die. I'm very happy that I am on the road to a quick recovery...as is my husband. 2010 is definitely looking up! Happy New Year to one and all. Super awesome project! I never did that technique either! A must try in 2010! This card and the box are both absolutely stunning. Your card is definitely CAS but it really packs a punch! Super job on the CAS challenge! So happy you were able to play along with us at the OCC this week! Hope to see you back with us again next week.